Holiday is a young man with a big reputation. Early in his career, he became known as a "Navajo Folk Artist." Actually, according to Leland, it was all an accident. "Everyone in my family knew how to make baskets, but I was not interested. I was just a kid and we didn't have enough money to buy toys, so my brother and I started making our own. People called them folk art, but they were just toys". But he did recognize a good opportunity. With the help of Farmington art dealer, Jack Beasley, he began to sell his work to many top dealers and museums. He was featured in several major museum shows at the Wheelwright Museum in Santa Fe and the Autry National Center in Los Angeles. 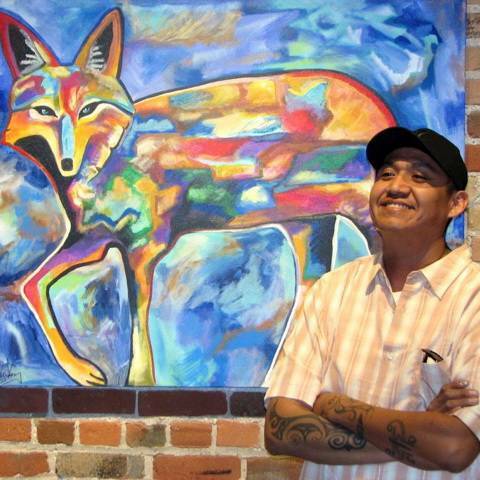 His work sold in many of the Southwest's finest Museums and galleries. His work with Mr. Beasley exposed him to classical art, urban art and modern Impressionism. He was drawn to the urban art he saw, but never thought of painting as something he would do as a career. He continued to experiment with carvings, but moved away from Folk Art. "I really don't want to be classified," he explains. "I want to be an artist that can break boundaries." As a teenager, he often broke traditional boundaries. "I would carve or paint things that were not supposed to be painted. I had a lot of the older people upset with me. I guess I was pushing against the traditional way of life, but I respect it more now." Today his paintings are shown in galleries in Wyoming, Colorado, New Mexico, Arizona and New York. Native Man 2 painting by Leland Holiday, COALH-250.